Instant access to over 1,000 FREE articles, tutorials, videos and other resources for modern ear training, from the leading provider of ear training online: Musical U. Do you want to have a better ear for music? To hear more detail and truly understand what you hear? The key lies in ear training. If you’re not training your ear, you are not reaching your full musical potential – it’s as simple as that! From the youngest children, to teen prodigies and adult learners, people all over the world are practicing ear training to hone their musical ear. … then you owe it to yourself to discover what your ears can really do! Ear training lets you connect the abstract “music theory” with the sounds you actually hear, so that you understand exactly what you’re hearing. 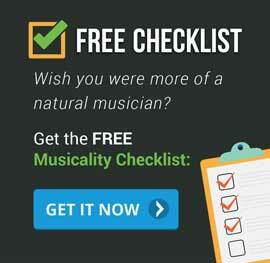 This lets you adjust your own music-making and instinctively react just like the “natural musicians” you admire. These “natural” gifts of musicianship (playing by ear, improvising, creating amazing new music) all come down to listening skills – which are learnable! And modern ear training can make the whole thing fun and easy. The Musical U app is your gateway to the world of ear training. You get instant access to over 300 free articles and tutorials covering every aspect of ear training. You can also sign up for a free ear training course, and explore dozens of ear training FAQs to get answers to those burning questions and problem points which you encounter in ear training – so that you can keep making fast progress. The app is updated with new articles as soon as they appear on EasyEarTraining.com each week, and you can share your favourites or save them to read later. Never before has such a vast library of ear training information been made available in one app and (for now) this app is FREE! 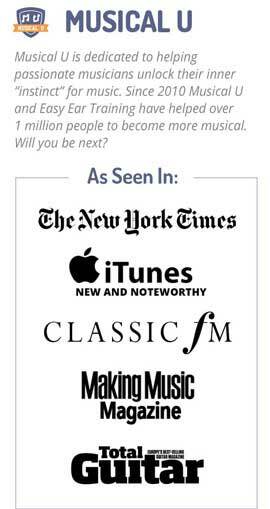 Download the Musical U app today and begin exploring the exciting world of modern ear training.